When it comes to kitchen essentials, there’s no denying kettles make the cut. Little works better for creating the perfect steaming cup of Earl Grey tea emitting those fragrant bergamot aromas. And don’t forget about that perfect water heat for your morning instant coffee. But as times move on, we’re sure to encounter some new kitchen trends. And the new countertop hot water dispensers are certainly one of them. These dispensers are here to prove that kettles aren’t your only means for getting the perfect cup of hot water. But are they really enough to dethrone the classic kettle? Read along in our guide to see if these water dispensers really are here to stay, or just a short kitchen fad. 2 Do You Need a Hot Water Dispenser? So, before we begin, let’s first explore what makes each of these kitchen appliances stand out. Sure, both do a good job of heating water—but they both do so in a different manner. So, let’s take a look at how these tools actually differ. These work great for saving energy. As a whole, hot water dispensers will only boil mug-fulls of water at once. Usually, this will vary from 150 to 350 ml of water. Either way, you look at it, it’s less water to boil than an entire kettle-full. Get your hot water fast. Generally, hot water dispensers will grant you a boiling cup of water in about 30 seconds to a minute. There’s no denying this surpasses the 10-minute wait of those old-school kettles. You’re going to pay more for them. In general, these are more expensive than your run of the mill electric kettles. You’re getting just enough water for one cup. This is perfect if you only need one quick cup of instant coffee. But if you’re looking to serve an entire party (or you’re super thirsty), you’ll be refilling the dispenser quite a bit—and waiting for the water to reheat in between filling each cup. You’ll always get the right amount of water. Dispensers will usually dispense enough water for a mug-full. So, with this in mind, you won’t be worrying about any accidental spills or splashes. You can boil a large amount of water at once here. This is perfect for those times you’ll be serving multiple people. Feel free to use non-electric versions in a variety of places. For these, all you’ll need is a hot surface. Again, this doesn’t exactly apply to electric kettles. You won’t need any guides here. Both electric and manual kettles tend to be super-easy to use. You’ll be waiting longer for your water. 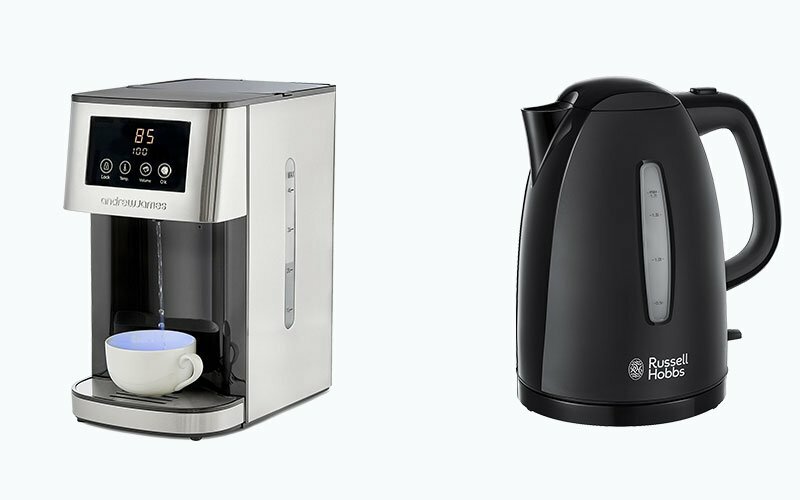 Most electric kettles will boil your beverages in about 10 minutes—not exactly ideal for those times your in a rush. These won’t cost you any real investment. As a whole, water kettles (even the electric ones) tend to be pretty cheap. On average, it’s not uncommon to find them for less than £30. Do You Need a Hot Water Dispenser? Do you need a countertop hot water dispenser? How much water will you actually need to heat? Generally speaking, kettles will offer you more water at once. So, if you plan on using this water for cooking or serving multiple guests, this is hands down your best option. As a whole, kettles you’ll shouldn’t have any problems finding kettles that can hold 2 litres of water. And some kettles will even hold larger volumes of water—perfect for tea refills and serving guests. On the flip side, most of your hot water dispensers will only heat around 350 mL of water—that’s really not much. But, if you’re only looking for enough water for a quick cup of tea, or maybe to heat your instant ramen noodles, this will be perfect. But keep in mind that some higher-end models can reach upwards of 2 litres as well. Also, keep in mind that boiling less water consumes less energy. So if you’re looking to save some money on your electric bills, hot water dispensers will win here as well. When it comes to our morning routines, we’re all different. Some of us wake up with hours to spare. Others of us are pushing the clock to get out of the door. So it’s very possible that this question alone will make the decision for you. Keep in mind that kettles will require more time to boil your water. And really, this makes sense when considering you’re boiling more water. On average, you’ll wait about ten or so minutes for your water to fully heat. And while this isn’t exactly long—it could make the difference between you being late or on time for an appointment. On the other hand, hot water dispensers will heat in about 30 seconds. So at that point, you can’t really even call it a wait. If you need your water fast, hot water dispensers are the way to go. So far, it seems like hot water dispensers hold a clear lead over kettles. But there is one area where a kettle definitely edges out—and that’s with price. If you’re pinching pennies, a kettle is definitely the way to go. On average, these rarely exceed £50. So it’s not like you’ll need to set aside any hefty investment here. On the other hand, hot water dispensers can cost 2x as much. Again, this isn’t any major investment, but it’s definitely enough to break tighter budgets. But if you don’t mind dropping some extra pounds here, then, by all means, pick up a hot water dispenser. At the end of the day, we can safely say that hot water dispensers are much more than the latest kitchen fad. In fact, these appliances can easily tackle all your hot water needs. The big question here is whether you’re willing to pay the extra money for them. So long as you have the budget and counter space, you really can’t go wrong here. So if you’re looking to get faster cups of boiling water, hot water dispensers just might be the tool for you!